Synthia Payne is an award-winning scholar, and an improvising vocalist and composer originally from Los Angeles, California. Her life's work includes producing multiplayer online live music sessions between musicians from all over the world playing together in real time. 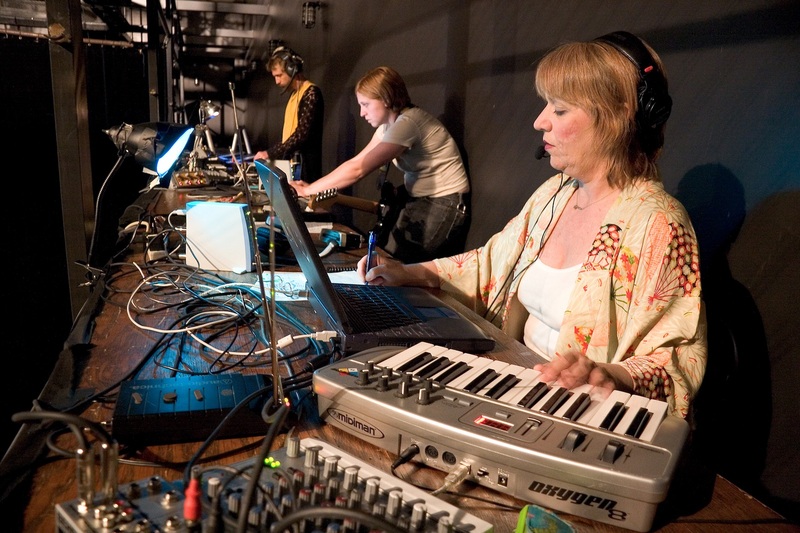 Synthia was commissioned by Chris Chafe at Stanford's Center for Computer Research in Music and Acoustics to compose a piece for a teleconcert, and in 2010 she was technical director for John Gunther's multi-location telematic concert performances at CU Boulder’s ATLAS theatre. Synthia holds an MFA in Digital Arts and New Media, and a BA in Film and Digital Media with an electronic music minor, all from UC Santa Cruz. Making music is part of who I am, and it comes naturally to me like a sixth sense. Perhaps it is because music is inherent in me that I feel responsible for making use of it in whatever way that I can. A lifetime musical collaborator, I have changed things up over the past couple of years and begun to focus on making music completely on my own. At first I approached the conception and production of music in much in the same way as I always did; composing through improvisation, and recording on the fly. With a bit more contemplation and planning I produced, “Arm Over Arm”, a requiem for a close friend's mother who had recently passed away. I was happy with the finished production, but it felt like I had not ventured very far from my usual way of composing, so I decided to begin experimenting with even more contemplation and planning before beginning production work. This is inherently a slower process and I don't have a lot to show for it yet, except in my own head. How do you make music? This is a perfect next question in the trajectory of my quest to do solo work vs. collaborating, and to begin premeditating vs. improvisation. So the two cornerstones of my method for producing music are gone, by choice of course, but what now? This is the question of how. I have been very fortunate to know and work with many fine musicians, whereas my talents seem to flourish in the realm of vocals and melody, so collaborative improvisation comes very naturally for me. Making the choice to work solo and with more contemplation, I have an opportunity to approach making music from a completely new perspective with very little collaboration or improvisation. I feel like I'm just starting out and only beginning to think about making music and asking myself this very question of how is it done. It's very exciting to me. For me, I think that the 'how' of making music is very much connected to the thoughts and activities in everyday life. For example, if I feel hungry my thoughts might turn to food. I begin to think about how a taco would be really good and I hear myself sounding of mmmmm....and this makes me sing and tap my fingers and toes and rhythms and sounds that are produced by those thoughts and actions might be the foundation for a potential composition. Is any of your sound-based work not ‘music’ as such and, if not, what is it? Turning towards solo contemplation vs collaborative improvisation I have developed a heightened sensitivity to accidental sounds like when two metal objects hit each other and create a tone or an interesting timbre. These are not necessarily music but they are sounds that could become music. Like my example of a vocal reaction to thoughts of food, the sounds made by people or ordinary objects are a fertile field of endless musical resources and possibility. How do you describe yourself (e.g. are you a performer, a composer, a technologist, an engi­neer, some combination of these or, indeed, something else) and why? These days, I am a dreamer, a failed entrepreneur, without access to a proper studio or an ethernet connection, nor am I affiliated with any academic institution. What is the cultural context for your work - how are you inﬂuenced by music from other cultures or the other arts? Tonight I listened to the creamy dreamy sounds of Mel Torme because I needed to hear his calm. Perhaps when I am composing a song that I intend to be comforting I will draw on the sounds of Mel Torme. I think that my process of making music is all about intention. Do I intend to make music that is influenced by a particular culture or artistic expression? I could imagine doing that as much as not really consciously thinking about it. But I think the music, culture and arts that I identify with organically run through the filter of me, or vice-versa, they are the filter that I run my intentional self through. What skills and attributes do you consider to be essential for you as a musician? Dedication, curiosity, optimism, sacrifice. Rinse and repeat. What do you understand by being "live" in a digital context? Everything that happens in real time is “live”, including anything that is considered digital. Being “live” involves an event or occasion of some kind, which could be a live performance, a live rehearsal, a live recording, a live playback, a live interview, or what have you, all of which could include digital components. How do you undertake networked performance these days? There are a number of reasons for my current inactivity in networked music collaboration and performance. For the past couple of years I have not had access to a proper studio or a consistent ethernet connection. It seems that I have failed to establish a networked performance community at any university or even at a grassroots level. I spent several years attempting to launch a startup that would provide services for people who wanted to set up their own internet music studio to do live online music sessions. However, my attempt to democratize and monetize networked music collaboration for the masses revealed that many musicians are leery of any online activity which involves real time communication with strangers, which is the main feature of the kind of networked music collaboration I envisioned. And now with net neutrality rules on the chopping block it seems that the lack of engagement for online music collaboration that I experienced was perhaps the writing on the wall for an unprecedented level of corporate power over internet access and usage. Also, I did not find very many non-academic musicians who were willing to take on the required technical specifications and multitasking activities involved in networked music collaboration. Do you have any other useful or relevant things to say about being a musician in the digital age? The above mentioned experiences have contributed to my current state of reinvention, but sauce thickens when you boil it down. That is, with or without external electronic devices, with or without collaboration, there is always music at the core of my being. Unplug, disconnect, start from scratch and see what you have to work with because altering your usual ways of working can cause positive disruption and perspective.